We went to the local RV show here in NH and found a Cougar half-ton 5th wheel that we liked very much, the 29RKS. It compares nicely to the Jayco Eagle HT 30.5 MLOK which we also like. The Jayco is about $5K or so more than the Cougar, but has a few features that I like better, one being no slide on the camp side giving nice travel access and the new MORryde Orbital Pin Box (optional but saves me getting a slider hitch). Opinions of one vs. the other? I know Ray and Anne have been with the Cougar on the road for years now but I haven't seen any other full time folks pulling Jayco 5th wheels. Thanks in advance for any opinions and advice. Looking at the specs the Cougar has more capacity for fresh water which would be nice for boondocking although you could cary extra water in portable containers. The Jayco has quite a bit more cargo capacity 2450 vs.1599. That could be a big deal depending on what you want to bring along with you. We don't own a fifth wheel but researching them back when we were considering one Jayco seems to have a pretty good name in the RV world. I really like the Cougar we have. We were looking specifically for a mid bunkhouse model and I was able to find a year old model in Idaho and I saved the “destination fee” of several thousand dollars the Camping World 2 miles from my house wanted to charge. The Jayco trailers I found seemed to cost more, but I thought they seemed to be a little higher quality also. I have owned two Cougar fifth wheels and been happy with both of them. We mostly dry camp for a week or so at a time a couple times a year and haven’t ever had any capacity problems with the tanks. I would say the added cargo capacity of the Jayco is a big perk. It’s amazing how easy it is to overload them. We owned a used Hartman RV for one year and had a lot of maintenance. I asked a RV shop supervisor, what he thought was the brand with the best maintenance record? He told me, “I never see JAYCOs.” We bought a 07 35’ JAYCO Designer 5 years ago and it just rolls down the road. We had a 2014 280RL Cougar and it was a piece of junk. When we bought it I found Ray and his blog on you tube about his fix's. I could write a book about the Cougar. It was a pretty unit inside but everything about it became a nite mare. Good luck in your choice. If you buy used look it over real good. Check the exterior ways for bulges and inside cabinets for leaks. Just give it a good look. Real Good. Thor has purchased a lot of brands including Jayco, Keystone, Airstream, KZ, Heartland, DRV Suites, Erwin Hymer (Roadtrek) and Dutchman. Like yourself I have heard people complain that quality has decreased in some cases. 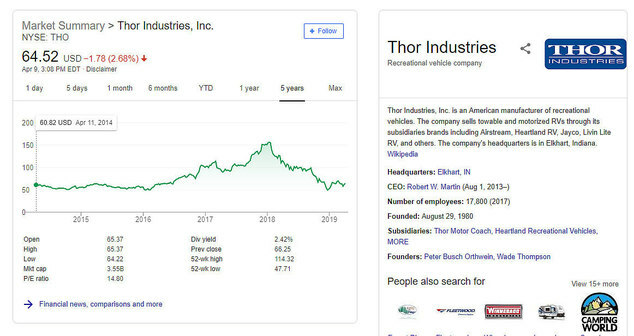 It's a little sad when independents get gobbled up by conglomerates like Thor. If I win the Lotto I think I would have Spacecraft build my 5th wheel. They are on a whole different level. ouch over 50% loss in 18 months. Glad I'm not a shareholder that bought in late 2017..
Getting Cold in eastern AZ!